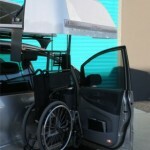 A specially designed roof mounted wheelchair hoist to allow you to store your wheelchair on the roof of your vehicle. 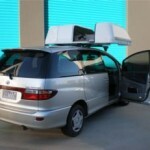 Developed to assist wheelchair users who are able to transfer, this exterior wheelchair lift automatically folds and stores a conventional folding wheelchair inside a stylish, weather-resistant car-top compartment. 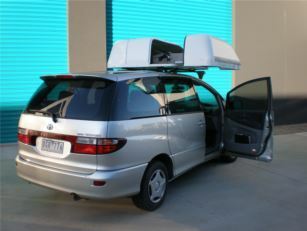 The need to store your wheelchair in the boot or backseat is eliminated, allowing family and friends to enjoy the comfort of your vehicle. 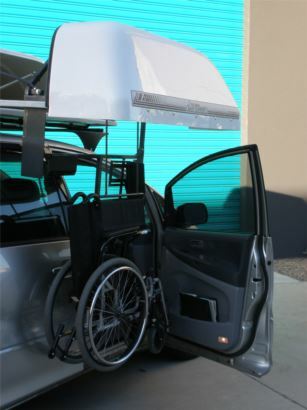 The Chair Topper’s universal mounting systems ensure this wheelchair lift will fit most automobiles and light trucks; the sleek plastic shell gives a finished, automotive look. 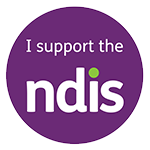 A convenient hand-held control operates the folding, lifting and storing of your wheelchair. 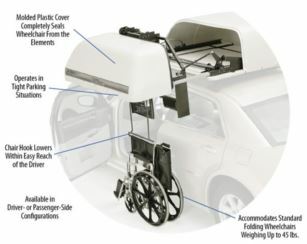 It takes only 30 seconds to complete the cycle, and the smooth operation ensures that your chair is carefully handled and transported without damage. 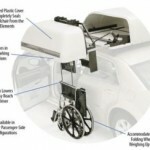 This wheelchair car lift is available in driver- or passenger-side configurations. 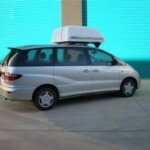 Due to its horizontal operation, the Chair Topper may be operated in home or public parking garages, with a minimum amount of space required beside the vehicle – a great feature for tight parking situations. 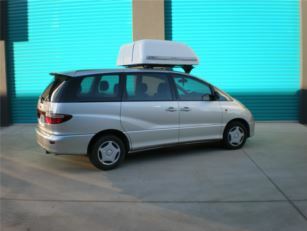 Contact us on (03) 9722 5050 or sales at Advance Mobility to speak with one of our qualified consulatants regarding the suitability of your vehicle for fitment.